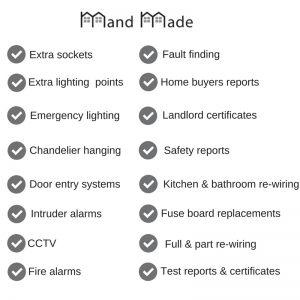 Here at Mand Made, we offer a wide range of electrical services in Sheffield. Working in the new build environment, our technical skills are complemented by our innovative approach. And we are expert at the sympathetic installation of contemporary electrical accessories into traditional buildings. Upgrading an old consumer unit to one incorporating RCDs (residual current devices) is a job that many people will now have to consider because the latest wiring regulations require most circuits in a domestic property to give you protection against electric shock. If you don’t live in a new property and your fuse board hasn’t been replaced since you moved in there is every chance that the installation won’t comply with the latest regulations. It may be that replacing the consumer unit, rather than attempting to change the existing installation to meet the new regulations, is the best option for you. Rest assured that we never take a ‘one size fits all approach’ and, keeping your household’s safety uppermost in our minds, we will design the most cost effective solution to bring your electrics up to current standards. The lights in your home aren’t there just to let you see what you’re doing when the sun goes down. They create safety and comfort, mood and atmosphere, truly enhancing the interior of rooms and the feel of exterior spaces. A ‘standard white plastic pendant light fitting’ might be all you want or need. In these straitened economic times, the humble lampshade has metamorphosed from a metal frame covered with fabric and now comes in myriad shapes, colours and materials, ready to lend any pendant fitting as much va-va-voom as it can take – at a price that will fit your pocket. We will install such a pendant fitting for you; safely, expertly and without breaking the bank. We can advise on the most suitable bulb for your needs. Can’t tell your GLS from your PAR38? Don’t worry; that’s what we’re here for. Always fancied a dimmer but don’t need the expense of buying the special switch and having it professionally installed? Ask us about the new light bulbs that will dim themselves when you give them the right signal from your existing switch (we don’t make them, we just know about them and think they’re great)! We will also design a lighting scheme if needed. With our professional understanding of lighting fundamentals, we will coordinate different light levels to showcase the unique features of any room and create the ambience you desire. These days, never ending choices of light fittings and fixtures exist to both satisfy and bamboozle you. Mand Made’s electricians can guide you through the lighting maze. Whatever the function, whatever the style you choose, please consult us before you purchase so we can advise you on the appropriateness of your selection to your situation and purpose. If you dislike ugly plastic wires snaking along skirting boards or across your walls, whether in the office or home, then perhaps it’s time to take a fresh look at how your digital life is connected. We can assist with computer network cabling, installing television and telephone points, automated blinds, shutters and gates, integrated Hi-Fi and TV systems. We even offer complete home automation so that you may control the lighting, heating and security functions of your home, wherever in the world you might be. We can help plan cabling systems for new builds and refurbishments, and we can also advise how to reduce the number of wires in homes and offices where major works are not feasible or where budgets are limited. We are sometimes asked to upgrade the electrical systems in a listed property, where chopping out a channel in the wall and devastating the construction, plasterwork and decor simply cannot be considered. In these circumstances, we install wireless receivers and transmitters, with accessories (switches, etc) that can be attached to the fabric of the building without the necessity for drilling or chasing out.